This article explains how to restore only the needed files from a backup. 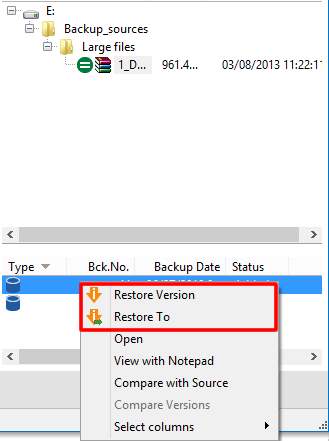 All file versions available for restore are displayed in the Backup number list. The file versions is a list with all versions to whom a file can be restored. 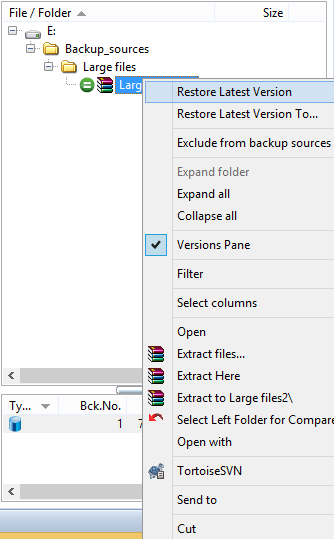 All file versions available for restore are displayed in the Backup number list. The file versions is a list with all versions to whom a file can be restored. In Backup4all there are multiple possibilities to restore certain files from a backup. Note: If the backup was password protected, during the restore process the password will be required. This action can be done only in the explore view from the application interface. It is the fastest method when restoring a single file/folder from a backup. Select a file/folder from the explore view window. Restore Latest Version To... in order to select another location for the restored data. This action can be done in the explore view from the application interface. Select a file from the explore window. 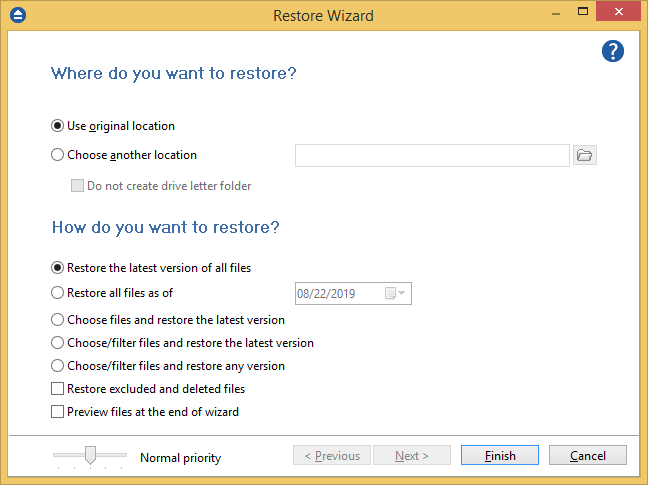 In the list from the bottom of the main window, all file versions available for restore will appear. Restore to... in order to select another location for the restored data. 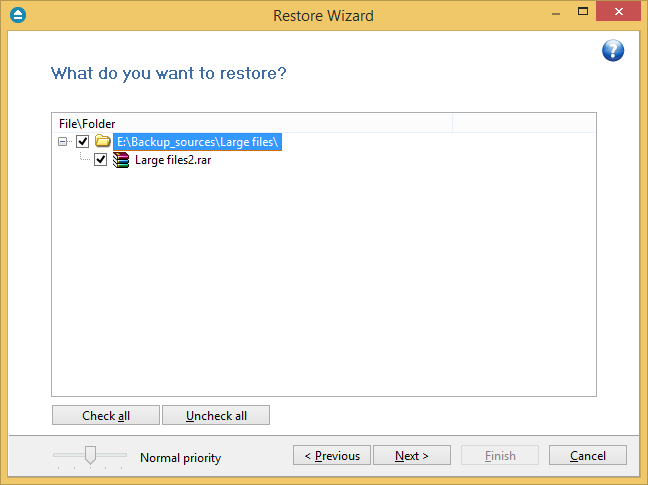 The Basic restore option is used when restoring from the latest file version of the backup. Normally, Backup4all will restore the latest version for all files in the backup. To restore only certain files you will have to select them using the Preview page. 1. Right-click the backup job and select Restore (or press F7). This will open the Restore Wizard. 2. In the Restore in section, select the location where the data will be restored. If you select Use original location, make sure that the same drive letters you had on the original location exist on your new hard drive. Backup4all will try to re-create the same files paths. If you're not sure what drive configuration you had, it is recommended to select Choose another location. If you select Choose another location, you can browse for a restore destination. Note: You can define some include/exclude filters to be applied to the files that are going to be restored. Only files and folders that match the filters will be restored. 3. On the Restore type section, select the Basic option. Click Next. 4. On the Preview page you can select the files and folders to be restored. 5. Click Finish and the restore process will be performed. The Advanced option is used to restore only some files from a file version selected by the user, with the possibility to add restore filters. Right-click the backup job and select Restore (or press F7). This will open the Restore Wizard. In the Restore in section, select the location where the data will be restored. In the Restore type section, select the Advanced option. Click Next. On the Versions page, you have to select the backup version to restore. Click Next. Click Next. On the Preview page you can select the files and folders to be restored. Click Finish and the restore process will be performed.